We often have meatless nights in our home to change things up a bit. I enjoy trying new recipes and sometimes I forget to defrost meat from the freezer. Then I tell my girls, it’s Meatless Monday (or Tuesday, Wednesday, whatever day it is!). I followed a vegetarian diet for about 5 years in my early to mid 20s. I tried many meatless alternatives and found they actually taste good! I loved my veggie burgers and still have them on occasion. Even if you buy a veggie burger product, doesn’t mean you have to actually make a veggie burger. In reality, there are so many yummy meatless dishes you can create! Take for instance Morningstar Spicy Black Bean Burger. Yes, you can make a good ol’ burger with all the fixins’, but you could also think outside the bun and come up with some creative alternatives! Think pizza, nachos, casseroles and more. I’m getting hungry thinking of all the delicious recipes. I have a good friend who doesn’t eat meat and has been a vegetarian since she was 11 years old. I knew her back then too! She’s planning to come for a visit soon so I’ll need to have some meal ideas on hand for lunch and supper. If you need inspiration for Meatless Monday or just because, try one of the recipes. Which of the featured meatless recipes do you want to make first? I’m so happy that you have meatless recipes, I love them all, but the one I’d like to try first is the Courgette/Zucchini burgers with tarragon mayonnaise, it looks and sounds yummy. Thank you for sharing these wonderful recipes. My daughter makes a stuffed pepper and your Mexican stuffed peppers sounds great. She also does a meat alternative spaghetti pie. It’s good. Some meatless meals are. We just don’t tell my husband they are meatless. 🙂 Thanks for the recipes. My niece is a vegetarian and I need some meatless options for when she comes to visit. She is now going to school very near us, so something tells me she will be visiting a bit more for some home cooked meals. Yummy ideas! I would love to try the Morningstar Spicy Black Bean Burger!! I like to make meatless meals twice a week because it is healthy. I want to make the Grilled Rustic Roll Ups. I like Morning Star products. They taste so good! I try and make at least 1 or 2 of the family meals meatless. Thanks for new ideas, Stacie! I already pinned the Chipotle Bean Burritos recipe. I eat those Morningstar black bean burgers all the time – they’re great! I’m looking forward to trying out the recipe for the Mexican stuffed peppers. My daughter is vegan and we have learned to incorporate and enjoy many meatless meals. Thanks for your suggestions! Will add a few to our book! 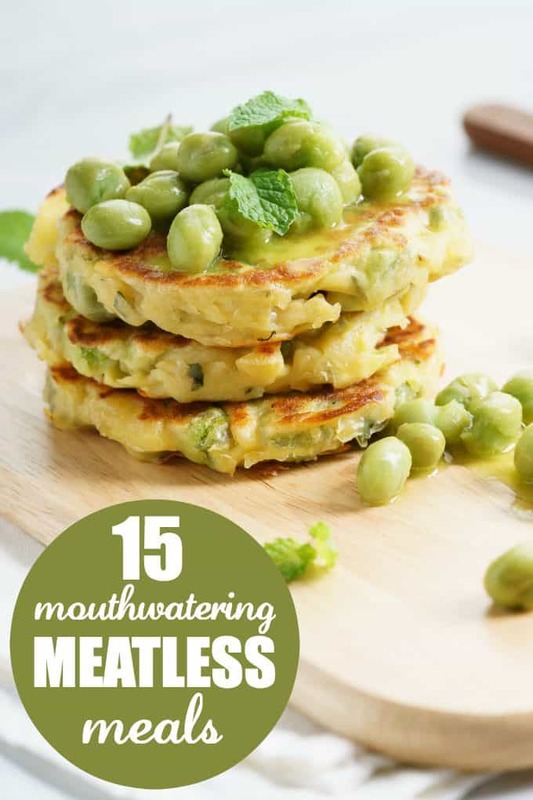 Thank you for some meatless recipe, I am trying to do one dinner a week meatless so I am sure some of these will come in handy! Awesome – looking to add some meatless recipes to our rotation! I love having meatless days! It’s always good to change things up. They sure look delicious. Looking forward to trying these quinoa recipes! ALWAYS looking for new recipes..t! Will be trying some of these. This is the direction I am heading towards: meatless. Thanks for this post! Thank you for sharing these recipes. I have been looking for some good meatless meals and will be giving these a try. Really lovely! So many wonderful and healthy recipes! I used to think I could never have a meatless meal – but we have them more and more often. As I age, just not that interested anymore. Thanks for sharing these recipes! My husband has a very sensitive stomach and can’t eat meat that often. It’s hard to find him tasty recipes that won’t bother him. I think he’ll love these! I want to make everything in one go. Too many awesome choices. Great selection of MOUTHWATERING MEATLESS MEALS. Thanks for sharing. The recipes all look wonderful. It’s so hard to find recipes that are meatless with a lot of taste! I use Vegetable broth in most of my recipes to bring out the flavor. I have been trying to reduce our meat intake but my carnivore hubby usually notices. These look great though. Thanks!